This is one of those recipes that always impresses me. The first time I made it I took the first bite and paused...then I turned to my husband, and said "Wow!". For some reason (that I cannot figure out)I haven't made it for probably a year....and tonight, I said to hubby, "Damn, this is good!". Heavenly really. I'm still reeling in the delight of tonight's dinner. The sauce is luscious and has a wonderful depth of flavor. Garlic and red onion almost melt into the pureed tomatoes. A pinch of red pepper flakes give the sauce just the slightest note of heat deep in the background. This goodness simmers for a bit, marrying all the flavors together. The sauce is finished by stirring in cream and evaporated milk. Then topped with fresh chopped basil and freshly grated parmesan cheese and this dish reaches perfection. Want to hear the cool part? 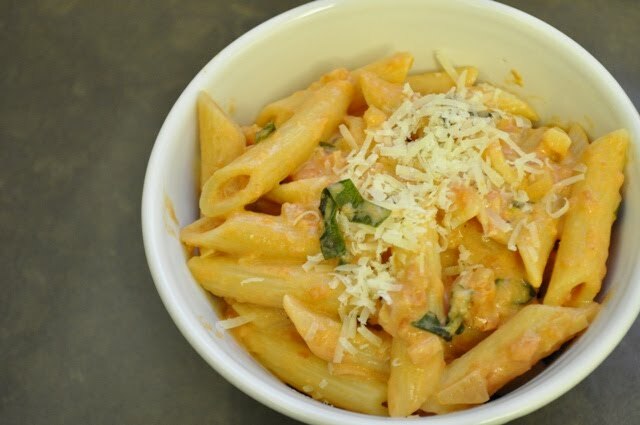 This is a healthy version of Penne Vodka and comes from the Cook Yourself Thin Ladies over on Lifetime. 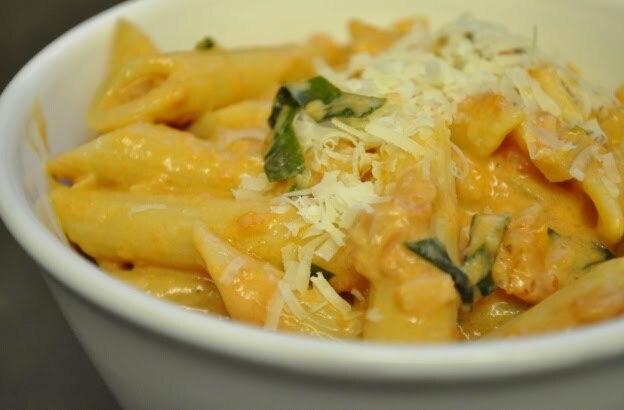 They call it Penne alla "Not-Ka." If you are interested in tasty lower calorie versions of recipes, I recommend checking out the recipes on Lifetime's website or the Cook Yourself Thin cookbook. One of my other favorite CYT recipes is their absolutely delicious Meatballs. I have even served the meatballs with penne alla not-ka in the past. The meatballs are light and pair nicely with the tomato cream sauce. Of course I think the tomato cream sauce is good enough to drink straight up. Man, this is a good sauce! A few tips for this very easy recipe. Use red onion. Not yellow, white, sweet or spanish. It's gotta be red. Don't overcook the pasta...it will continue cooking when it gets transferred to the sauce. Remember to set aside some of the pasta water to get just the right consistency of pasta and creamy sauce. And lastly, I almost always double the recipe to ensure lots of tasty leftovers for lunch or another quick dinner. 1. Bring a large pot of salted water to a boil for the penne. 2. In a large saucepan, heat the 2 teaspoons oil with the garlic over low heat until the garlic begins to brown, about 3 minutes. Add the onion and 1/4 teaspoon salt, cover, and cook until the onion is softened, about 2 more minutes. Add the tomato, 1/2 teaspoon salt and the red pepper flakes. Bring to a simmer, reduce the heat and simmer very gently 10 minutes. Stir in the cream and evaporated milk and simmer 1 more minute. 3. Meanwhile, after the sauce has cooked 5 minutes, add the penne to the boiling water and cook until just shy of al dente, about 6 minutes. Drain, reserving about 1/2 cup pasta water. Add the drained penne to the saucepan and simmer until the penne is al dente, 1 to 2 minutes, adding a little of the pasta cooking water if the mixture is dry. Stir in 1/4 cup of the Parmesan, along with the basil and black pepper. 4. To serve, divide pasta among 4 serving bowls. Drizzle each serving with 1/2 teaspoon olive oil, and sprinkle with the remaining Parmesan. This sounds awesome Gloria! Pasta dishes are always popular at my house so I'm bookmarking this one for a weeknight dinner sometime. I read this one after looking at the cupcakes and now my stomach is seriously GROWLING! It looks delicious!